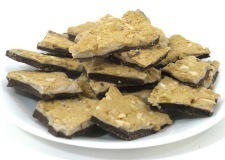 We now offer Chocolate Maple Bark - a delicious Chocolate Maple Fusion that our customers taste test right in the store, and invariably go home with a pound or two for later! Hard Maple Candy and Fudge Gifts are always appreciated, especially when it's plain maple fudge or maple walnut fudge combined with hard maple candies into a 2-piece gift combo... YUM! But our specialty of course has always been pure maple candy, like the ones shown drying here. 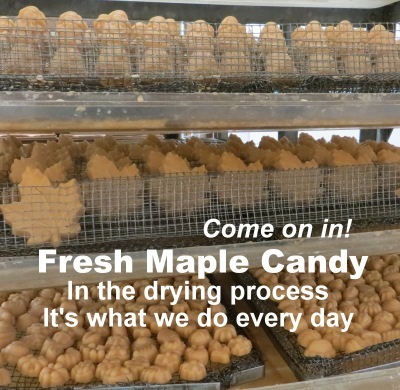 We make fresh maple candy every day. It's what we've been doing for over 25 years! Best of all, we are proud to say that our candies are made using pure Vermont maple syrup procured from small, northern Vermont local sugarshacks. 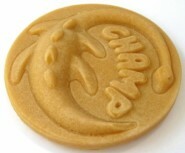 CHAMP - The Monster of all Maple Candy®. These fun candy shapes allow us to offer our customers something new and different." 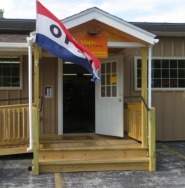 Whether you are traveling north from Burlington, Vermont or south from Montreal, QC we're just a short drive away, so why not stop in and see us? 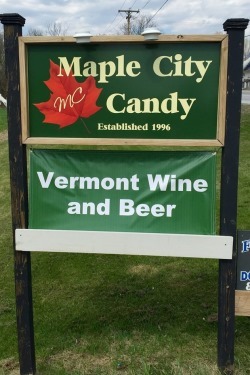 We're just off the highway and open from 9:00 AM to 5:00 PM Monday through Saturday..
Our friendly staff is ready to help you find the perfect Vermont maple candy, specialty foods, souvenirs, travel and holiday gifts, and soon... maple flavored ice cream! We are now also carrying a hand picked selection of Vermont made beer and wine. Come try a maple flavored breakfast stout. It's delicious!